Observing the silly looking yet endearing actions of pets can give us a lot of insight into the little creatures. If your pet rabbit has a penchant for running like crazy in his cage, it could indicate anything from the simple need for physical exercise to a desire to mate. If your pet rabbit gets no time outside of his cage to move about and run, you may notice him making up for it by running back and forth within his living quarters. Running comes naturally to the furry creatures. Remember, they are prey creatures through and through. In order to remain healthy and content, rabbits require a few hours of daily physical fitness. Without sufficient physical exercise and space to move their muscles, rabbits are often vulnerable to ailments such as muscular atrophy. Rabbits possess strong and sturdy back legs that are useful both for leaping and running quickly, according to the ASPCA. 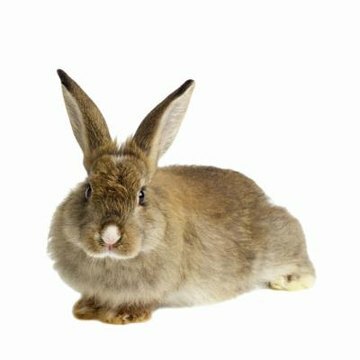 Make sure your bunny has ample space to exercise within his cage, so look for one that is at least 2 feet in height, 4 feet in width and 2 feet in depth. Outside of the cage, a designated exercise pen inside your home or in your backyard is absolutely crucial. If the pen is situated in your yard, make sure it is secure with fencing. Always closely monitor your pet as he runs and jumps inside of the pen. A rabbit running back and forth inside of his cage could also be in the middle of a classic binky session. In the rabbit world, the term "binky" signifies good old-fashioned play and fun. If your rabbit is running, kicking, leaping and perhaps even moving his head around, then he's simply having a good time -- nothing more and nothing less. Running is also frequently a mating stance for rabbits who are not neutered or spayed. If a bunny is running back and forth, his motive may be to gain the attention of a member of the opposite gender. Apart from the frenetic running about, you may hear some repeated low grunting sounds coming out of your pet -- another telling indication of mating urges.